In January of 2002 many Canadians watched the five-part series Quest for the Bay produced for History Television by Frantic Films of Winnipeg. Filmed in the summer of 2001, the series followed the exploits of eight modern day tripmen as they retraced the 19th century York boat route between Winnipeg and York Factory on Hudson Bay. 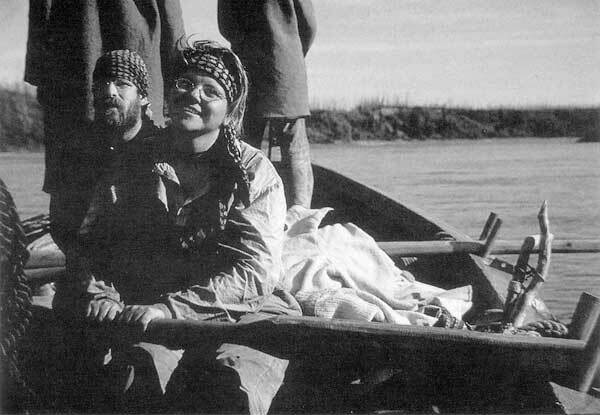 RoseAnna Schick was a member of that York boat crew and in this article she relates the story of their remarkable 1200 kilometre journey from the Forks to the shore of the great inland sea. Some people define themselves by what they have; others by what they can do. I chose the latter in signing up for Quest for the Bay, knowing it would prove to be the biggest challenge, of my life. It all began when Winnipeg-based Frantic Films began seeking applicants for a History Television series. The concept was exciting enough—reenact an 1840s York boat trip using only period-appropriate gear and provisions. No one had attempted such a voyage for nearly a century. In fact, no living person had done what the production company wanted eight modern-day adventurers to do. The author rowing on the Hayes River approximately 10 km south of York Factory, 30 August 2001. There was a good chance the 1200 kilometre journey from Winnipeg to York Factory on Hudson Bay could not and would not be completed in 2001. Back in their day, York boats were rowed by strong and experienced men already conditioned for the grueling work. It was their way of life. They knew the route and the risks. Even then, with all their knowledge and advantages, many still did not survive. Yet, the moment I heard about the trip, I knew it was something I wanted (and had) to do. I expected the experience to test me in every way—physically, mentally, emotionally, and spiritually—and welcomed it. But I also knew it would be extremely difficult, even terrifying. The thought of entering into the desolate unknown and being able to cope with the many unpredictable obstacles filled me with an overwhelming feeling of apprehension, not to mention the paralysing fear I felt when I realized how dangerous the trip could ultimately be! Above all else, though, I knew it would be an incredible once-in-a-lifetime experience that would change my entire life in some immense way. In order to find out how, I was willing to chance the distress, the discomfort, and the danger. The process of getting accepted had many stages, including a medical exam, criminal check, psychological assessment, and finally, strength and endurance testing. As I sat there and silently watched some people complete their physical tests, and others quit half-way though (including some very fit individuals), I questioned my own abilities. I knew I was strong, but was I strong enough? Approaching Lake Winnipeg, 3 July 2001. When the eight “Tripmen” met for the first time and were introduced to the massive boat—what was to become our home for an entire summer—it seemed a huge undertaking. 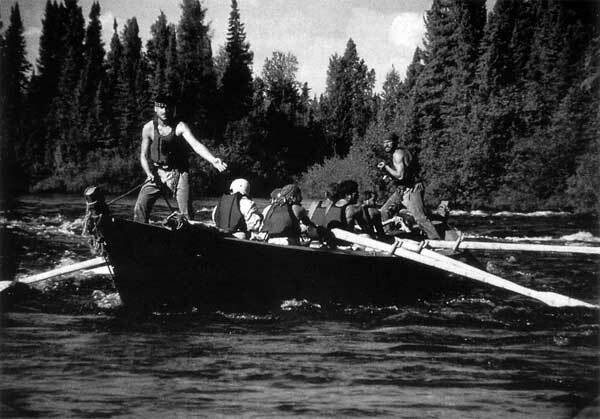 The boat (christened “The Hudson” but became known as “BOB”) was handcrafted in Norway House. It was beautiful, weighing close to 2,800 lbs, spanning 40-ft long and 8-ft wide. The oars were enormous, and left me wondering how in the world we (especially me) were going to be able to do this. With help from Larry Duncan, our York boat coach from Norway House, we learned how to row together, pulling the oars in synch with the pacer, and listening for the sound of the oarlocks knocking. It was an exhilarating feeling, and a skill that took extreme focus. If you didn’t pay attention, the force of the oar would knock you right off your seat! After only a few hours both my mind and shoulders began to ache, and I discovered muscles in my hands that I didn’t even know existed! The thought of rowing this boat to the Bay seemed ludicrous. Between rowing training we were fitted for our “costumes” consisting only of the bare essentials they would have had in the 19th Century—two pair of pants, two shirts, two pair of socks, one pair of drawers, suspenders, vest, a woolen coat called a capote, moccasins, and hob-nail boots. The wardrobe was completely funny looking, and for the first while we felt like pirates! In keeping with the mood, we started saying “AAARRRRR” a lot. For some, wardrobe also consisted of historically accurate wired frame glasses. The only woman in the group, I was provided with added cotton provisions for that “special” time. I certainly wasn’t looking forward to dealing with that along the way. At first, being the only woman was daunting, especially when everyone else looked so strong and experienced. But I knew there was a reason I was chosen, so I pushed my nervousness aside and secretly vowed to do my best. After all, that truly was all I could do. A few days before leaving, I had lunch at a Chinese restaurant—one of the last good meals I would enjoy for quite some time. When I opened the fortune cookie after, I couldn’t believe my eyes. It was like the message was written just for me: Your path is arduous but will be amply rewarding. They seemed like good positive words of encouragement, and exactly the kind I would need to get through the most difficult moments. So I kept that little piece of paper and taped it inside my trip journal to take with me. I had no idea just how inspiring that message would prove to be. Before we knew it, the time was upon us to depart. Returning to our boat on Canada Day, packed previously with 4,600 lbs of provisions and cargo, we discovered what happens when a leaky boat gets weighed down. Shocked to find everything swimming in two feet of water, we were introduced to bailing, a skill soon to become second nature in BOB. After a few hours of scooping water and re-packing our goods, it was time to meet the masses. Sailing on Lake Winnipeg, July 2001. The send off at the Forks was surreal and spectacular, with thousands of people there to cheer for us. We were overwhelmed and emotional as we hugged family and friends, laughed and cried. No one knew for sure how the next few months would play out, how long the journey would take, or if all of us would even come back alive. There were simply no guarantees. In spite of the fear and uncertainty, our loved ones celebrated and gave us their blessings. They released us to seek out the adventure of a lifetime, to find ourselves somewhere out in the wild, and to return home safely. One by one, we bid them each good-bye. Then we were off. There was no turning back. Starting out slowly, we spent time in Selkirk working on the boat and repacking the gear and cargo. Everything provided was made of wood, metal, or cloth, reflective of what York boat tripmen would have used in 1840. It was obvious right away what we didn’t have—insect repellent, matches, sleeping bags, tents, rain gear, flashlights, toilet paper, sunglasses, and the list went on. The realization of not having anything modern made it all seem very real. We were no longer just talking about and preparing for some big adventure—now we actually had to live it, using only what was given to us. It was obvious we would have to be innovative and resourceful just to survive the elements. This was not going to be any ordinary trip. It took a few days before things began to sink in (no pun intended). By the time we reached Lake Winnipeg on Day 5, we were battling fierce headwinds—our welcome from the big water! Stopping for the night at the mouth of the Red River, we watched gigantic waves thrashing and crashing into the shore and clawing at our campsite, while the wind pelted gusts of stinging sand. At that moment, knowing we would have to cross this mighty lake, for the first time I truly understood what we were up against. It was intimidating. During our training, Larry spoke some simple yet important words: “In order for the boat to be balanced, each one of you has to be balanced.” This made absolute sense, and made me think a lot about my own inner balance. I wanted to ensure I’d be strong enough for what I was about to endure, so when a friend offered to conduct a traditional Ojibway sweatlodge for us before departing, it seemed like the very thing needed for peace of mind—and spirit. Crossing the Painted Rock portage between the Echimanish and Hayes rivers, late July 2001. My first experience in a sweatlodge was empowering, humbling, and rejuvenating all at the same time. When it was my turn to share what I was seeking from the Creator, I asked for four things: protection, strength, confidence, and courage. A few weeks later, standing wind-bound on our tiny beach at the south end of Lake Winnipeg and looking north across the endless expanse of wild white-capped water, I thought again about the sweatlodge. In a strange way, I felt comfort amid trepidation. Somehow, I knew we would make it safely as long as we chose honour and respect—for each other, for what we were doing, and for where we were going. I also knew the biggest contribution I could personally make to the group was to encourage honour and respect along the way. While my physical strength could not be matched with the men, my spiritual strength was to become my greatest asset. Crossing Lake Winnipeg—one of the largest freshwater lakes in the world—was the first major milestone in our journey and an adventure unto itself. The water is vast, mysterious, and seemingly infinite. Our first day on the lake brought a strong tailwind, and we crossed the majority of the southern basin in one effort. Portaging at the Robinson Falls, late July 2001. Feeling confident, and not wanting to stop with the wind still to our advantage, we sailed on into the sunset. As darkness descended, the wind changed direction without warning. Suddenly, we found ourselves desperately needing place to land, with no safe haven available. We rowed on into the night, fighting big waves that threatened over and over to slam us into the shallow rocky shore. After a few aborted attempts at landing, we finally found a beach protected from the furious winds by a narrow spit of land. In blackness lit only by the light of the almost-full-moon and candle lantern, we claimed our little piece of solid ground as we set up camp on the south end of Hecla Island. We were exhausted, but feeling our first small sense of victory. It felt good. Our time spent in the south basin of Lake Winnipeg included a stop at Gull Harbour to honour the spirit of Marits’ father, whose ashes were scattered in the lake the previous winter. While an emotional moment for all, it ultimately helped strengthen our belief in the many good spirits out there that would be watching over us. We found solace in knowing we would be protected on our journey. Prior to reaching the Narrows, a short stretch of water that officially divides the south from the north basin, we became wind-bound in a tiny community called Loon Straits. Here we met many wonderful people, and experienced true Lake Winnipeg hospitality and tradition. After three days, it was exceptionally hard to leave, never knowing what was coming next. “Bob” runs the Kakwa Falls north of Oxford House. On Day 12 near Princess Harbour (a once thriving town with only a handful of people left) we shared our first mental breakdown. To date, the mosquitoes had been horrible! At night they swarmed outside our Hudson Bay blankets, mercilessly crawling through every vulnerable crack and antagonizing us to no end. No one slept that night on our small island, as we attempted to keep a fire burning while struggling for our sanity. When we fled to the boat at dawn after another bland breakfast of oatmeal and tea (which we ate every single day) and tried to row with zero energy, we realized the problem had to be solved fast. The next day we called an emergency meeting to deal with the issue of sleep-deprivation. Sitting down together on shore, we brainstormed over different ideas. After drawing various architectural designs in the sand, and much thought and discussion, we finally agreed upon an A-frame tent structure that could be created using our boat tarp and some thin spruce tree trunks. For the next three days, every spare moment we had was put towards sewing a tent, one tiny stitch at a time. It had to be large enough to sleep eight people, and the task took great patience, but we all realized it was something we desperately needed. When at last it was finished, we finally had a home. Having a tent completely changed our outlook and enthusiasm. It brought a positive boost of energy and much-needed relief. For the first time, we could work hard all day and welcome sleep at the end of it all—rather than dreading another nightfall. For the first time, we actually felt like we had the strength to reach York Factory. From that day forward, we took on a new sense of determination. Over time, the bang of the oars became a soothing and hypnotic sound one that exuded teamwork, power, and confidence. The motion of rowing became comfortable and repetitive, and we found ourselves concentrating less on technique and more on each other. We could talk and laugh together, share stories, sing songs. Somewhere along the way, we became more than just a team. We became friends. 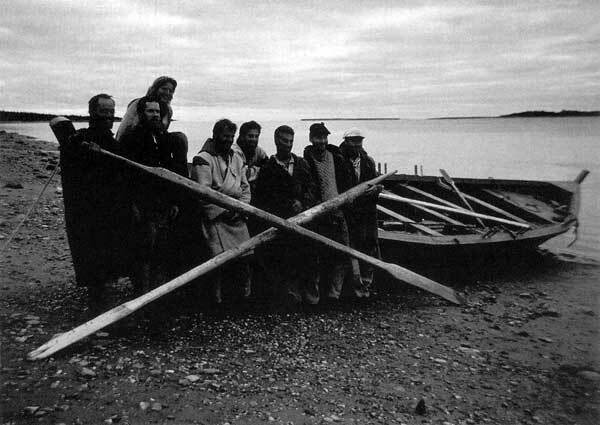 We worked together day after day, making our way one kilometre at a time across the northern basin of Lake Winnipeg. Sometimes we rowed, sometimes we sailed. Always we stopped to camp on another spectacular sandy beach that stretched as far as the eye could see. Always we ate pemmican, bannock and oatmeal. By this time, the novelty of the food had completely worn off. There were some incredible days on the lake that I will never forget. Like the time the water was so calm it blended right into the hazy sky, erasing the horizon and making it look like a never-ending grey abyss. 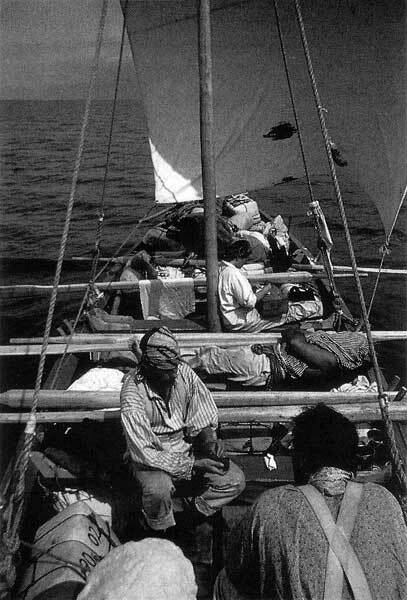 Sometimes it was so hot we’d huddle for relief in the shade of the drooping sail, our only hope for defense from the scorching sun. There were days we’d row straight into headwinds, dodging rocks and fighting to gain ground. But the best days were having a tailwind with the sail up —boy, could BOB fly! On July 19 we reached Norway House, our first big destination. Completing the lake was a wonderful sense of achievement, especially for Kenny who is from Norway House. We were ready for a celebration! A brigade of four York boats greeted us on Playgreen Lake, and escorted our vessel into the community. The welcome was truly overwhelming, with drumming and singing, dancing and fiddling. We were treated to a traditional feast of moose meat, pickerel, bannock, beans and potatoes, lunching in the old Hudson Bay fort by candlelight in the company of Elders. It was a magical moment. Upon departing, we participated in a group sweatlodge, which helped us refocus on our task, our goal, and being a team. It was exactly what we needed at that time, because everyone knew the most challenging part of the trip was still ahead—the Hayes River system. 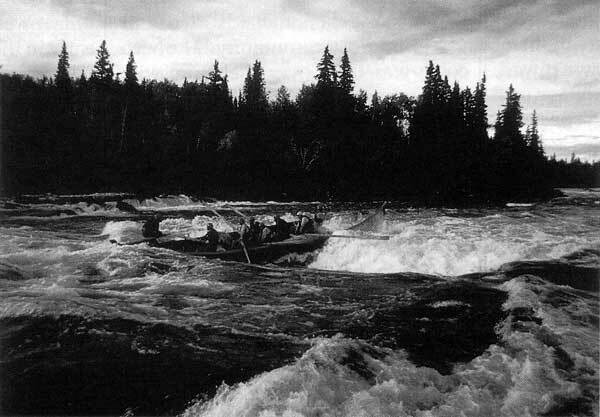 Navigating another set of rapids south of White Mud Falls on the Hayes River, late August, 2001. The largest naturally flowing river in Manitoba, the Hayes remains pristine and untamed, virtually as it was when the Hudson Bay Company traders first traversed its waters in the 1680’s. But before reaching the Hayes, we had to complete the Echimamish River—a 30 km. stretch of water notorious for beaver dams. 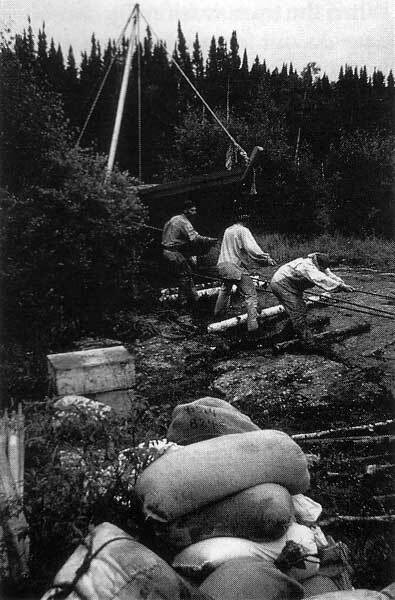 And even before that, we had to contend with our first portage. Upon reaching Sea Falls, a stunning stretch of whitewater spilling over ledges and drops, we had not yet had the chance to test BOB in fast water. Instead of risking it this early in the game, we opted to portage over a small island in the centre of the rapids, a distance of about 50 paces. Nothing! Or so we thought. It took us two entire days to span that meagre distance, in the most foul weather imaginable. It was not fun at all! 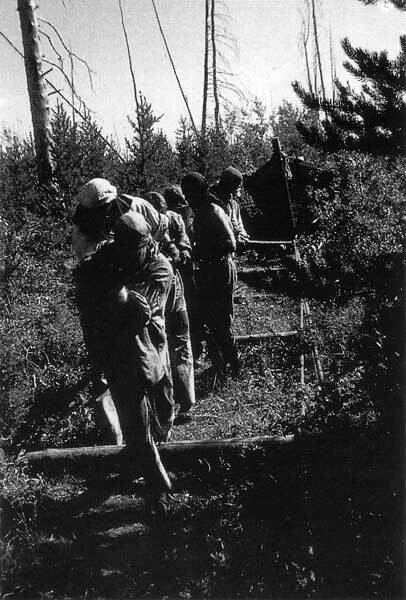 In fact, it was tremendously difficult and unpredictable, with the entire team pulling on a rope connected to a squeaky old block-and-tackle, heaving with all our might to drag BOB one inch at a time across a path of rollers cut from poplars. We had to constantly stay alert of potential hazards, and be ready to dodge them when necessary. Keeping a safe distance was also critical, so as to not get crushed by either the boat or rollers. To top it off, we had to do all this while trying to remain upright in our hobnail boots—which, on the rocks, felt more like ice-skates. It was tricky to say the least! Portaging tested our strength and resolve in a big way, pushing us to absolute limits both physically and mentally. In total, we completed five portages between Winnipeg and Hudson Bay—an astonishingly small amount, considering we could have faced up to 30. Robinson Falls, the longest portage at a distance of 1.6 km, tested the boundaries of our group dynamics. It took seven days to complete, working from sunrise to sunset in staggering heat scattered with typhoon-like storms. While it splintered our team and nearly broke it apart in the process, by the end we were drawn together even closer. The wilderness instills in you a great sense of empowerment, and we felt it on that evening we finally rowed away from Robinson Falls into the setting sun. We had conquered our biggest challenge yet, and were feeling steadfast and unstoppable. We had figured out how to portage. Now all we had to do was master the rapids. Most of us had canoed or kayaked rapids prior to this trip, and understood the limitations of small watercraft. Not one of us had ever attempted rapids in a boat as massive as BOB. At one time, the Hayes River was a super-highway for Hudson’s Bay Company York boats, with dozens of brigades running downstream, and back upstream, each year. But a boat of this grandeur had not traversed these rapids throughout most of the last century. We were attempting something that had not been done for a very long time. And even when it was, the task was undertaken by experienced York boat tripmen who knew what they were doing, and knew the waters. We didn’t know either. Maneuvering BOB through whitewater became a thing of precision, exhilaration, and anxiety all at once. Each set of rapids was a brand new test to see how much the boat could endure, and how much we could manoeuver it in fast, furious and unforgiving waters—the same waters that claimed countless lives along the way. 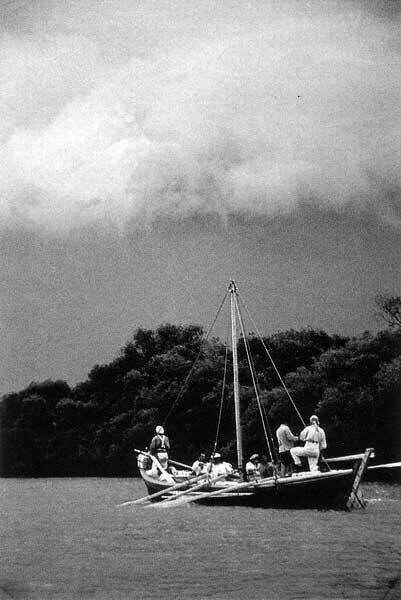 With Paul in the stern, Geoff on look-out in the bow, and the remaining six of us on the oars with our backs to the rapids rowing with all our might, we relied on trust while responding to frenzied commands. Running whitewater was absolutely thrilling and completely terrifying at the same time. It was a tremendous rush of courage and adrenalin—with just enough fear to keep you alert. Sometimes the runs were incredibly smooth fun, better than the best amusement park ride. Then there were more technical rapids, where we’d have to zigzag around treacherous rocks and ledges in order to avoid dangerous collisions that would very easily destroy the boat (and us) in an instant. The difficult runs did not always go smooth. All too often things would not go as planned and we’d get precariously stuck along the way, perched on the edge of some hazard with BOB threatening to flip right over, or take off like a wild pinball in some wicked game. Out of control, BOB would ricochet on a rampage from one treacherous obstacle to another. At these times, we’d have no choice but hang on for dear life, completely at the mercy of the raging waters and our guardian angels. On a few occasions we did major damage to the boat, which set us back substantially—not only in days lost, but also group moral. It was hard for the team to keep positive at times, and muster the motivation to persevere. When we finally sunk the boat late in the trip, and were forced to abandon ship and spend six days in repair, it was extremely discouraging. By that point, we wanted so desperately to finish the trip. But now, we had completely jeopardized the strength and integrity of the boat. Would it even float after the extensive damage? If it did, would it hold up in the many more sets of rapids still to be run? Do we take the chance of causing even more damage to the boat—and ourselves? The wilderness has a way of reminding us that we are not invincible. No matter how in control you think you are, and how cautious you are being, all it takes is to witness the sheer force of nature to make you see just how fragile and vulnerable you really are. Instances like a dead tree falling silently in our midst, without warning, and within a mere foot of two people. Had it struck, it would have surely killed them on the spot. Or BOB hitting a rock, stopping dead, and catapulting the bowsman headfirst into water shallow enough to smack the bottom and break your neck. Or being forced to abandon ship in the middle of a ferocious rapid that could have claimed any or all of our lives in a split second. Indisputedly, there were several “close calls” along the way. These moments were unmistakably meant to keep us humble, and remind us we were at the mercy of our surroundings every step of the journey. We were dealt just enough difficulty and danger to keep us aware. Yet miraculously, not one of us suffered serious injury. In many ways, this experience restored our faith in a higher being. It also restored our faith in ourselves. From the start, we believed we could, and were determined we would, achieve what we had set out to do. After 61 arduous days we accomplished our hard-won goal of reaching York Factory. The last stretch involved a virtually sleepless 48-hour push into strong headwinds, building in velocity the nearer we got to Hudson Bay. It seemed nothing was going to come easy for us, with the final 150 km of the Hayes River being the hardest, most exhausting rowing of the entire trip. At the end of a long journey: the “Quest for the Bay” tripmen on the beach at York Factory, 30 August 2001. In total we journeyed 1200 kilometres, crossed 10 lakes, travelled four rivers, struggled over five portages, and shot through 45 sets of rapids. We suffered blistered hands, aching backs, antagonizing insects, blazing heat, chilling cold, stinging rainstorms, rotten pemmican, and mouldy oatmeal. We also met incredible people from communities all over the north, and witnessed breathtaking sunrises and sunsets, spectacular starry nights, dazzling northern lights, sparkling beaches, and gorgeous waterfalls. We did something no one had done for a very long time. In the process, we learned more about each other and each about ourselves. There were times we doubted we would ever reach York Factory. In fact, we doubted it was even possible to begin with! We doubted the reliability of our boat, and the tools we were given to work with. We doubted the route. We doubted our abilities. We struggled with our surroundings, and with our sanity. We were challenged individually and collectively, confronted with each other every single day, and forced to get by with what we had. It was an extreme exercise in deprivation and determination. It was also an exercise in perseverance and empowerment. It was about having a reason for being and the strength of mind to discover it. It put life into perspective in so many ways, and instilled in me a renewed sense of self. It taught me to appreciate the choices we have in our 21st century lives, and to slow down and live in the moment. It took 61 days to get there, and four hours to get home. It was a wonderful, terrible, exhilarating, exhausting, thrilling, terrifying, seemingly endless and absolutely incredible once-in-a-lifetime journey. Above all, for myself, it was a quest for strength, confidence and courage.